Russian President Putin speaks with President Erdoğan at a press conference in Istanbul on bilateral relations and the Syrian civil war, Oct. 10, 2016. Skeptics curved their lips in disbelief when in August 2016 President Recep Tayyip Erdoğan voiced an optimistic expectation for Turkish-Russian relations to rapidly exceed the levels of cooperation enjoyed before the 2015 crisis that stemmed from Turkey downing a Russian jet, and would shortly return to normal. "Bilateral trade had reached $38 billion by the time of that incident," Erdoğan said in reference to the Russian jet. "Afterward, the trade volume dropped to about $17 billion. We will now resume our aim to increase bilateral trade to $100 billion." Grounds for pessimism were present – too much damage had been inflicted on relations from the Russian SU-24 fighter bomber downing over the Turkish border in November 2015, and the still bitter rhetoric voiced in the aftermath echoed in August 2016. But regardless of expressed concerns, Turkish-Russian rapprochement instantly started to gain momentum after the countries' two presidents met in St. Petersburg on Aug. 8, 2016. Shortly after, the countries relations returned to normal, and contacts and exchanges received a fresh boost. Turkish-Russian state-to-state interaction has progressed most during the past year and neared strategic maturity through extending to regional security and military co-operation. Turkey and Russia are currently closing on the sale of the Russian S-400 missile systems to make Turkey the first and only NATO member protecting its airspace with the Russian-made defense system. "Being a NATO member does not mean we are not independent," Erdoğan said after his meetings with Russian President Vladimir Putin last March. "We can have close ties with Russia while performing our responsibilities for NATO. We find objections on this matter inappropriate." Enhanced during the past year, Russian-Turkish partnership has produced some new, and at times, unexpected alliances. In December 2016, Turkey, Russia and Iran signed a tripartite agreement to join efforts to reach a peaceful settlement in Syria that shortly afterward produced the Astana process to become a major contributor to the Geneva peace talks on Syria. This newly emerged triumvirate built on Turkish-Russian, Turkish-Iranian and Russian-Iranian bilateral ties, which by now has proved itself a result-generating working mechanism balanced by mutual compromise and concession. The most convincing evidence is the Syrian de-escalation zones slowly, but surely taking place. Based on the Astana agreements reached in May, three de-escalation zones – in Deraa and al-Quneitra in the south of the country, in the opposition enclave of Eastern Ghouta near Damascus and in Homs province in the center – have started functioning, while the fourth and most difficult to establish zone in the northwestern province of Idlib is in the process of taking shape. The evolving and enhanced Turkish-Russian partnership has enriched the countries cooperation with new and never-seen-before specifics such as tolerance and flexibility. The former adversaries build successful partnerships and come to compromises while continuing to adhere to opposing positions. Gone are the days when black and white and yes or no approaches were the backbone of their respective foreign policies. Pursuing conflicting scenarios in resolving the Syrian crisis at times, Turkey and Russia jointly provide for cooperation and an efficient and productive outcome. As a result, a newly sophisticated geopolitical reality has started to take shape to become the mighty means for reaching a peaceful settlement in the Middle East. In a July 24 interview, Russian Foreign Minister Sergey Lavrov said that "mechanisms fixed in Astana and currently becoming practice are a product of joint effort aimed at cooling down the situation [in Syria] through ending hostilities in parallel to assistance in the resolving humanitarian crisis. By common opinion, the active and result-generating momentum of the Astana process has largely contributed to reanimating the Geneva process that was kept frozen for nearly nine months and was freshly boosted just last January, and we welcome this development." 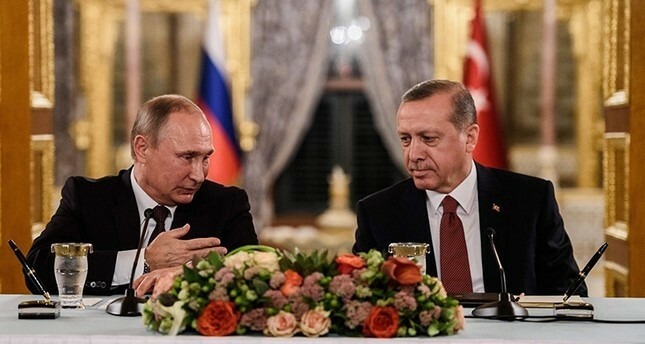 The past year saw the approximation of Turkish and Russian foreign political positions on a combination of issues buttressed by the mutual strife for the alliance of equal partners. At the same time, as senior advisor to the president İlnur Çevik pointed out on the eve of Erdoğan and Putin's meeting in March 2017: "Moscow and Ankara's close cooperation is no alternative to Turkey's relations with NATO. Building Turkey's alliance with Russia, as well as with Israel, has a potential to stabilize the international situation in the Middle East that is currently in chaos." Russia's tough and independent stand on a variety of international issues is common knowledge. "In no way do we want to influence the ongoing developments [in other countries]. Still, we reserve our right to communicate with all and every representative of a political establishment [of a foreign country] the way our partners in Europe and the U.S. do," Putin said after his meeting with then French presidential candidate Marine Le Pen on Feb. 24, 2017.Meanwhile, Turkey's recently acquired and increasingly independent foreign political stance is a relatively new reality. Independently from each other, Turkey and Russia today face a conflict with long-established Western power balances and adopted scenarios to interfere with their presence in the regions of interest, such as the Middle East. While the region as a whole continues as a hotbed of instability, Turkey and Russia's interests there increasingly meet the most. Energy cooperation, and in the field of natural gas particularly, is the backbone of Turkish-Russian governmental relations. Turkey has been importing Russian natural gas since the 1980s. Around 27 billion cubic meters (bcm) of natural gas annually comes to Turkey from Russia, making it over-dependent on the Russian supply as Russia's second-largest gas importer. Russia's share of Turkish natural gas imports reaches 60 percent against the 20 percent share of Iran, while deliveries from the Caspian region continue to be modest. The situation may well remain unchanged as long as Turkey continues being a major consumer of Russian gas and Russia a major gas exporter. A speedy recovery during the past year of relations in this particular sector has proven once again the ultimate truth that Turkey and Russia are natural partners in the field of energy. But the long-established seller-buyer relationship is about to experience a change with the second line of the TurkStream becoming a reality. Turkey and Russia have a good chance to become the joint suppliers of Russian gas to Europe via the Black Sea. While being heavily dependent on Russian gas imports, Turkey enjoys a strong transit potential for Russian gas deliveries through the southern export corridor running transit-free from Russia to Turkey and established a decade ago by the submerged Blue Stream pipeline. The TurkStream's first line, expected to be commissioned by the end of 2019, will deliver some 15 bcm of gas for Turkish consumption, and construction of the TurkStream's second line of a similar capacity to supply European countries with Russian gas may soon start. Russian gas deliveries to Europe have gone up by 15 percent during 2017, according to Russia's Gazprom, "to make possible the implementation of our major gas-transportation projects to definitely include TurkStream," as recently acknowledged by its head, Alexei Miller. Bright prospects awaiting the TurkStream and the progress accomplished in its construction increasingly acquire an additional value these days. The newly adopted U.S. legislation on Russian sanctions may well make the future of the North Stream-2 pipeline looking less bright. This brings into focus the potential capacities of the Russian southern export corridor laid down by the Blue Stream commuter that has established a direct line from Russia to Turkey safe from bottlenecks and risks of transit through conflict-prone countries. It currently brings 16 bcm of natural gas to Turkey a year. If constructed, the TurkStream's second line of 15 bcm will be coming ashore in the proximity of the Turkish-Bulgarian border and will travel across Turkey toward Greece. To provide efficiency of the future pipeline and ensure it works smoothly without squabbles and bottlenecks, Turkey and Russia will have to handle its operation together as good partners. Natural gas has become more political rather than just a fossil fuel issue in recent decades. Today, it is a mighty power tool capable of building alliances and triggering dramatic conflicts and rifts. Turkish-Russian gas relations are a success story, and they have been steadily progressing for nearly 40 years. As a result, Russia is by far the largest natural gas supplier to Turkey today, accounting for more than 50 percent of the Turkish gas market, while Turkey is the second-largest importer of Russian gas after Germany. Turkey's overdependence is both a stimulus for deepening Turkish-Russian energy cooperation and a backbone for ensuring stability of Turkish-Russian state-to-state relations. The amicable resolution of the November 2015 jet crisis has revealed the countries' leaders ability to step past enmity and distrust for the benefit of joining forces in an alliance of partners.